SANTA CRUZ, Calif., U.S. — Verve Coffee, a Santa-Cruz based roaster that produces world’s highest quality craft coffee, today announced the launch of a first-of-its-kind, ready-to-drink Nitro Flash Brew Coffee. As the only flash-brew ready-to-drink coffee on the market, Verve is leading the industry into the next wave of convenient craft coffee. Verve’s Nitro Flash Brew Coffee is created using a completely different brewing technique than cold brew or iced coffees. Flash Brew starts with Verve’s finest directly-traded coffees, including Ethiopia Natural Mormora and Verve’s Southern Colombian Farmlevel Coffees. The coffee is then brewed with hot water using state of the art craft brewing equipment. After precise extraction through a proprietary hot brewing process in an oxygen-free environment, it is flash chilled and infused with nitrogen. Nitrogen removes any remaining oxygen, keeping the coffee ultra-fresh and providing a creamy mouthfeel. The result is a clean and silky brew that tastes sweet, vibrant and complex, with notes of berry. The category-first launch of Verve’s Nitro Flash Brew Coffee is also the brand’s first step into the ready-to-drink space. 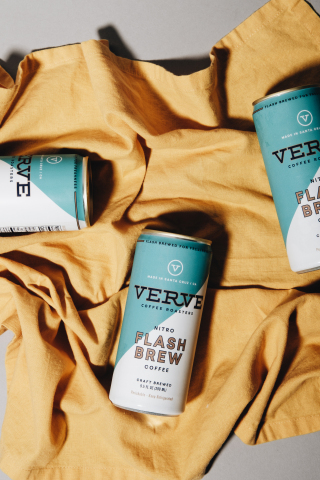 In direct response to customer demand for high-quality, craft coffee, Verve spent years researching, developing and testing its Nitro Flash Brew Coffee before its launch. Verve’s Nitro Flash Brew is available for purchase for $3.99 in all Verve café locations in Santa Cruz, Los Angeles and San Francisco, is rolling out online over the next month, and can be found at select retailers and grocery stores.